Both Dr. Flowers and Sara Flounders confirmed that Presidents Chavez and Maduro had constructed 6,000 medical clinics, trained 18,000 physicians, and built almost three million housing units to provide decent homes for the poorest citizens. They had also provided the highest per capita availability of pharmaceuticals in Latin America. Living standards for the poor dramatically improved. Attorney Kevin Zeese confirmed that the current Venezuelan constitution guarantees human rights and defense of law and civil society. He added that there were 168 credentialed international observers during the recent re-election of Maduro, and they confirmed that Maduro won 68% of the vote. There is zero legitimacy to Guaido’s farcical claim to the “interim presidency,”: according to the Venezuelan constitution, only if Maduro was too ill to govern, or dead, could he be replaced, and then, only the Vice President could legally replace him. Following the failed coup against President Chavez in 2004, the US, in violation of international law under the Rome Statute, imposed illegal sanctions to cripple and ultimately destroy the Venezuelan economy, and since 2017 have imposed coercive economic sanctions which are tantamount to modern day piracy. The US and its proxies, including the UK, have stolen billions of dollars belonging to the Venezuelan people, and have blocked pharmaceutical supplies, crippling the medical system; when Venezuela attempted to purchase medications from India and Turkey, the US blocked that. In 2014 US President Obama declared Venezuela a national security threat, opening the way for military intervention. The criminal methods used to destroy the democratically elected government of Allende in Chile are being repeated in an attempt to destroy the Maduro Presidency, and steal the richest oil supply on the planet, and other precious natural resources that belong to Venezuela. Zeese confirmed that the coercive sanctions against Venezuela are violating the UN Charter, and should be challenged in international courts. There is solid evidence that the blackout in Venezuela, following Guaido’s failed coup d’etat, was engineered by the US-Guaido junta: according to Sara Flounders, blueprints for the blackout attacks were traced to a source in Chicago with software equipment based in Houston, Texas. The infamous U.S. police “advisor” Dan Mitrione trained the Latin American military in updated torture techniques; Mitrione kidnapped homeless beggars on the streets of Brazil, stripped them naked, and demonstrated various torture methods on their live human bodies, as a result of which these human guinea pigs died or were murdered. This is an example of U.S. aid to Latin America. In the half century since then, massively sophisticated methods of sabotage of the economies of countries independent of Washington’s control have been devised, and if these do not succeed, Washington and allies resort to military intervention, often employing the U.N. Security Council as enablers, as was the case in Libya, in 2011, and in 1991 in Iraq. Today Venezuela, the world’s country richest in oil is the target. Any hosannas of concern for the people of Venezuela are fraudulent, as desperate refugees from other countries are ignored or imprisoned by the U.S government, as are the numerous homeless, impoverished citizens of the USA, a dangerously increasing number. On April 10, U.S. 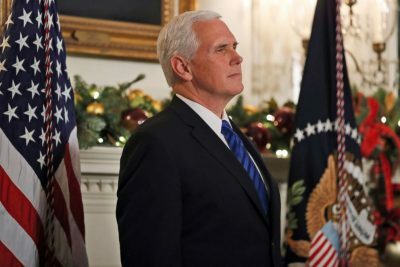 Vice-President Pence disgraced himself at the UN Security Council by questioning the Venezuelan Ambassador’s authority, and pressuring the UN Security Council to revoke his legitimate credentials. Venezuelan Ambassador Moncada is a gentleman, otherwise he would have replied to Pence that the government of the United States is so grossly discredited, including by more than half its citizens, and still undergoing a probe of corruption by the Department of Justice (paid for by U.S. taxpayers), that Pence should not be sitting in the UN Security Council, but his own credentials should be revoked, and he should be replaced by Bernie Sanders.